This is our printable 2017 SEC Football Schedule Grid for all SEC schools for the 2017 SEC football season. The 2017 SEC football schedule has been set, however look for it to change multiple times before the season starts. The SEC finalized the 2017 football schedule on September 13, 2016. 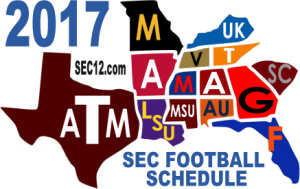 Find the games for each SEC team on this one page SEC Football Schedule for the 2017 season. Each school plays twelve games this year and has one open date during the regular season. The SEC Football Championship Game will be played on December 2, 2017 at the new Falcons Stadium in Atlanta. Download our 2017 SEC Football Helmet Schedule. View our 2017 SEC Football Composite Schedule for weekly SEC football matchups.